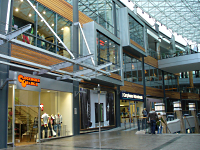 With eight stores province wide, Clockwork Orange has rapidly become the number one independent destination for fashion, lifestyle and youth culture in Northern Ireland. With brands including Hilfiger Denim, Miss Sixty, Firetrap, Replay, Energie, Killah, Ted Baker, Ripstop, Diesel and Adidas, Clockwork Orange hosts an ever changing global brand mix, from established denim giants to the best in directional independent clothing and accessories. Six of the eight Clockwork Orange stores now have Audica Professional audio systems, including the new flagship store in the impressive Victoria Square complex in Belfast. The systems have been designed and installed by audio specialist, Lisburn-based Zest Audio. Zest MD, David Honeyford, explained the history behind the choice, “Clockwork Orange originally used a different brand, chosen for the aesthetics of its very small satellites, but it was a sub/sat system with a high crossover between the two and it particularly did not work well in the Belfast International Airport store. Due to the shop's open-fronted layout and acoustics, the bass was a big problem; massively heavy near the serving counter and inaudible elsewhere – so in many areas you were left listening to mid/high satellites and no mid/bass”. “The rest, as they say, is history. 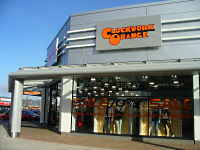 We have now gone on to complete six stores for ClockworkOrange, as well as many, many others. We always get great results and if a sub is needed in larger spaces the Audica Professional MICROsub just adds true sub and does not filter the full-range frequencies to the main speakers, so the sound is always superb and well-balanced throughout”. For the new two-level Belfast store, Zest installed a total of fourteen MICROpoint loudspeakers, driven by three MICROzones which provide the pre-amp, system controller and amplifier functions. The system uses a Denon CD to provide a high quality source.